At the beginning of this success story stands Enzo Ferrari. Enzo was born near the Italian town of Modena on 18th February 1898. When he was ten his father took him to a motor race in Bologna, and from that point on the little Enzo was convinced: he wanted to be a racing driver. After the First World War Ferrari became a test and delivery driver for a Turin truck company. 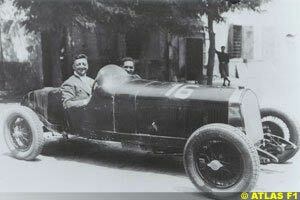 In 1919 he drove in his first motor race and seized fourth place straight off in an Italian mountain championship race. One year later, Alfa Romeo accepted him into its works team. At Alfa, as well as driving, Enzo Ferrari began to concentrate on constructing and developing cars and managing his own team. This is where his real strength lay. In 1929 he founded a works team for Alfa Romeo, the "Societ� Anonima Scuderia Ferrari"- the start of a success story which has endured up to the present day. As a driver he often failed on account of technical inadequacies, which led Ferrari to develop his own formula for success: first the engine, then the car, then the team and finally the driver. Niki Lauda, one of the most successful Ferrari drivers ever, remembers: "When we won then it was Ferrari who had won, not the driver, because Ferrari was the best car. When we lost, it was always the driver's fault. Enzo was a very emotional person. As a race manager of the Old Guard he was of the opinion that a driver should consider himself lucky to be driving for the team." Enzo launched his own company in 1939 and in 1947 the first genuine Ferrari made its debut at a sports car race in Piacenza: a Tipo 125 Sport. It already bore the classic red colours and the rearing horse on a golden background as its badge. The Formula One World Championship was brought to life in 1950, but it was to be a year before the team was able to celebrate its first victory at Silverstone. Jos� Froilan Gonzalez won driving the Type 375 with its 12-cylinder, 4.5 litre, 350 hp engine. The Argentinean "Pampas Bull" was given a sports car instead of winner's prize money. The engines in particular were the focus of technical development at that time, and Ferrari is today still the only team to build its own engines and not to rely on an outside supplier - a pedigree stable in fact. "We are true car builders," Ferrari always stressed. The Alfas managed to secure memorable wins in 1950 and 1951, but the change already began with the Italian Grand Prix of September '51 when Scuderia celebrated victory in all the top five positions. In the two years that followed, the team dominated the racing scene with top driver Alberto Ascari. 14 Ferrari wins in succession and two World Championship titles for Ascari were the outcome. A new rival arrived on the scene and the winners' stand in 1954: Mercedes. The double silver arrow clashes with the shark's mouth, and the German team took the title in '54 and '55 with its Argentinean star Juan Manuel Fangio. 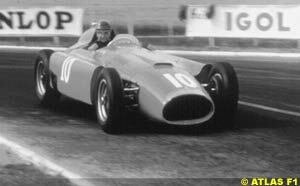 It wasn't until Fangio switched to Ferrari and Mercedes pulled out of Formula One that Ferrari were able to win again. Fangio became Champion. 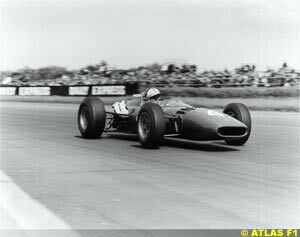 However, success bred negligence: the British team Cooper developed the mid engine and Ferrari held on to the front engine. Mike Hawthorn, who always drove in a green jacket and bow tie, still managed to secure the title in 1958 with one victory and five second places, but the season was not one of celebration: the Ferrari drivers Luigi Musso and Peter Collins both suffered fatal accidents. Enzo Ferrari's company underwent radical changes. It was made into a public limited company and sports car production rose constantly. Formula One and other racing series consumed money, but Enzo saw the racing sport involvement as advertising for his hot-blooded sports cars. The new Ferrari engineer Mauro Forghieri developed a new Squallo (shark) for 1961: the 156 with a 6-cylinder mid engine and independent suspension. The Ferrari drivers Phil Hill, Wolfgang von Trips and Giancarlo Baghetti dominated the class completely. German driver Trips' terrible accident, which killed him together with 13 spectators, decided the result: Phil Hill was the new World Champion, just one point in front of his dead teammate - a title which the American could never be happy about. "Even if we were great rivals on the track," Hill recalled, "Trips and I were still friends." Scuderia also won the constructors' title that year for the first time. However, two lean years were to follow during which the team slept through the move to 8-cylinders. 1964 saw Ferrari enter the series with only two drivers for the first time for reasons of cost. Enzo Ferrari chose former motorcycling world champion John Surtees and Italian Lorenzo Bandini. Surtees won at the Nurburgring, at Monza and then took the World Championship just one point in front of Graham Hill, who drove for BRM. The constructor's title went to Ferrari too. 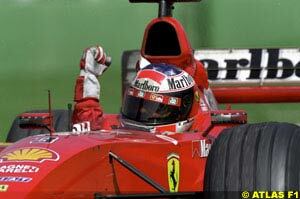 After that, it was to be another eleven years before Ferrari was able to celebrate a World Championship title again. The time between was full of setbacks, tragedies and missed chances. The English teams Brabham, Lotus and Tyrrell dominated this era and remained always a step ahead of the Italians with their technical developments. Bearer of hope Lorenzo Bandini exceeded his limits at the Monaco Grand Prix in 1967 and died from the injuries sustained in a disastrous accident. His Ferrari clipped the barrier in the Harbour chicanes, took off, turned over and went up in flames. Enzo Ferrari took what was for him a very difficult step in 1969: he handed over 50% of the Ferrari shares to Italy's biggest car group, Fiat. Ferrari was no longer the sole boss, although the Turin company's financial backing did mean he could enjoy new prospects in Formula One. With the new car type 312 B, Ferrari was back up to date by 1970. The 3 litre boxer engine with 12 cylinders returned a tidy 460 hp and Belgian Jacky Ickx turned out to have the stuff of champions. An exciting duel developed in the course of the season between Ferrari and Lotus. Lotus' top driver Jochen Rindt lost his life at Monza, but his five-point lead was enough to make him posthumous World Champion in front of Ickx. The victories of Ickx and his teammate Clay Regazzoni gave cause for hope for the years to come, but in fact this never developed to fruition. Three wins over the next three years were not enough for the "Commandatore" from Maranello. 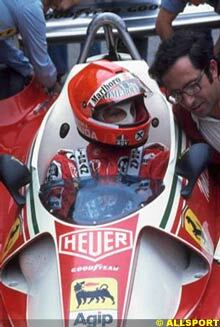 Ferrari abandoned endurance motor racing and began to concentrate fully on Formula One in 1974. This had consequences among the personnel. A young lawyer, Luca di Montezemolo, who had made a name for himself with Fiat, was put in charge of the team. Niki Lauda, who Enzo considered to be a great talent, was acquired from BRM. And indeed Lauda showed his class in his very first race, coming in second at the Argentinean Grand Prix. The double victory of Lauda and Regazzoni in Jarama, Spain, made the 'macchine rosse' favourite for the title once again. Emerson Fittipaldi was made World Champion at the end of the season, but second place for Regazzoni and in the Constructors' Championship raised hopes for the season to follow. The 312T was a completely new construction. Positioning the gearbox transversely allowed the rear of the car to be aerodynamically reshaped and Lauda was delighted by the machine. The balance for the year 1975: Ferrari was back, with five victories for Lauda, the World Championship and the Constructors' title. Italy was in motorsport seventh heaven. And the success continued - until the tragic 1st August 1976. The Nurburgring, which had long been the target of those campaigning for increased safety in racing, proved to be Lauda's undoing. His Ferrari turned over, careered out of control on the 'Bergwerk' straight and caught fire on an embankment. Lauda sat in the fire trap for an everlasting 40 seconds before his colleagues Merzario, Ertl and Edwards were able to pull him out of the wreckage. Doctors fought for his life for days on end, and the Austrian survived the crash heavily scarred. Then the impossible happened: six weeks later Lauda got back behind the wheel and finished in fourth place at Monza. The title battle against James Hunt was once again exciting. The final race in Japan was to be the decisive one; Lauda had a three point advantage over Hunt, but when he reached the 'Death Straight' in torrential rain during the first lap he quit the race. The memories of his accident at Nurburgring were too fresh, and with them his doubts about safety. Hunt became World Champion and Ferrari was left with the Constructors' title. In 1977 Ferrari's long list of success stories became one longer. Lauda led ten times in points and gained his second World Championship and, together with Carlos Reutemann, the Constructors' award. 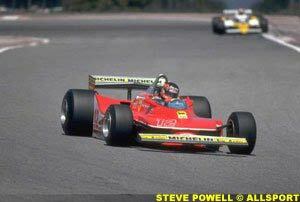 Lauda switched to Brabham, but Enzo already had the next talent under contract: Gilles Villeneuve. Villeneuve was the people's favourite. A thirty year old with angelic looks but who drove like the devil; no-one braked so late, no-one could overtake so spectacularly. The 312T4 and the team with the daredevil Villeneuve and the South African Jody Scheckter triumphed all the way in 1979: three wins for each driver, Scheckter became World Champion, Villeneuve runner up, and Ferrari won the Constructors' Championship. 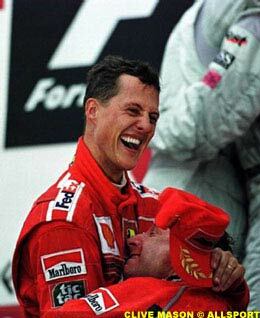 Scheckter said of the secret of their success: "Villeneuve and I were not just teammates, we were friends. We wanted to win the races together and so we agreed to exchange all our technical information." But again success was followed by setbacks, and this time it hit Ferrari especially hard. The 3 litre 12 cylinder was no longer competitive and 1980 was the worst season in the factory's history. When it came to the new monocoque construction they limped way behind. Ferrari signed up the British designer Harvey Postlethwaite. The 1982 model battled for the title, particularly after a double victory by Villeneuve and Didier Pironi in Imola. Then came the 8th of May: while practicing for the Belgian Grand Prix, Villeneuve smashed into the March of German driver Jochen Mass. His Ferrari took off and Villeneuve was flung from the car. He died the same day. Millions of racing fans mourned. Ferrari had lost a great talent. The second blow came during practice at Hockenheim: Pironi dropped out for the rest of the season after a serious accident. In the end the Frenchman was a mere five Championship points behind Keke Rosberg. Ferrari won solely the Constructors' title. This they managed to repeat the following year. The team suffered increasingly from internal conflict, bickering over responsibilities and waves of dismissal. Continuity was made impossible. Enzo Ferrari died on the 14th of August 1988, and arguments about his successor damaged the company further still. The three times World Champion Alain Prost was brought in for 1990. His workhorse, the F190, was a terrific car with only the 680 hp engine inferior to the Honda units. Prost won five races, and the decisive moment came in the second last Grand Prix of the season in Suzuka. Ayrton Senna and Prost collided. Senna was World Champion, Ferrari came in runner up once again. 1991 was devoid of opportunities and Prost's continuous criticism led to his dismissal. Luca di Montezemolo became Ferrari's president the same year, and the racing stable was gradually restructured. However, other teams such as Williams, McLaren and Benetton were still better. Good drivers like Gerhard Berger and Jean Alesi simply could not match them. The new concentration of forces peaked in 1996 with the signing up of the twice World Champion, German Michael Schumacher. Who else could possibly claim the title for Ferrari if not him? The 1997 season was similar to the Prost season of 1990: five victories for Ferrari and the World Championship decided in the last Grand Prix, again the result being against the Scuderia. After Schumacher's controversial collision with Canadian Jacques Villeneuve, the title went to Villeneuve, son of the legendary Ferrari driver Gilles. The line of approach for 1998 was clear: the World Championship title was again on the Maranello crew's agenda. At first the Ferrari high-performance cars came behind the technically more stable F1 racers from McLaren. With his excellent driving skills, Michael Schumacher gained mastery over the problematic engine characteristics of the Ferrari to such an extent that the races remained thrilling and full of suspense right up to the last Grand Prix. Point after point went to the account of the Ferrari star. From race to race the red F300 became increasingly consistent and Schumi carried it to sought-after pole position. Hard luck at the end: after failing at the start in Suzuka, the driver from Kerpen had to tackle the field from the back of the grid - and accelerated away brilliantly to make up ground. Lying in third position Schumacher had to bury all hopes of the World Championship title: a burst tyre at 300 km/h thwarted his and the Ferrari team's ambitions. And so, Mika Hakkinen carried home the World Championship title with 8 victories in his McLaren Mercedes. Ferrari started the 50th season in better circumstances: Eddie Irvine had a surprise win in the starting race in Melbourne, marked by breakdowns. But already from the second race the old duel between Hakkinen and Schumacher was rekindled - just as if it was an extension of the previous season. Firstly, the German delighted the Ferrari team as he at last, after 16 years, drove to a victory for the reds on the Imola home stretch. There was even a double victory to celebrate in Monte Carlo; Schumacher was invariably talked of as a contender for the title. Then, at Silverstone, Schumacher raced into a tyre barrier with the force of 300 km/h. Result: a leg broken in two places. Hakkinen's second World Championship title seemed now a foregone conclusion. But the Ferrari team didn't give up. At Hockenheim, Irvine and substitute Mika Salo proved their class and took first and second. Ferrari's title hopes now rested on Irvine's shoulders. Schumacher made an impressive comeback in Malaysia just 100 days after his dramatic accident. Because of a dispute about the barge boards on the F399, the Ferrari team was disqualified, only to be reinstated 6 days later. Once again the decision would rest in the last race at Suzuka. However, Hakkinen proved that he had nerves of steel and carried home his second World Championship title. Eddie Irvine was runner-up. Nevertheless, Ferrari's impressive team performance was rewarded: for the first time in 16 years the Scuderia team again won the Constructors' World Championship. At the 2000 Japanese Grand Prix, Ferrari finally ended the longest and most disappointing chapter of their amazing story, with Michael Schumacher achieving their first driver's crown since 1979 and earning immortality amongst the Formula One heroes. What will come next, only time can tell. Atlas F1 © 2000 Kaizar.Com, Incorporated.